Surprise! A large bowl filled with pansies appeared on my table by the window. Just look at those colors! 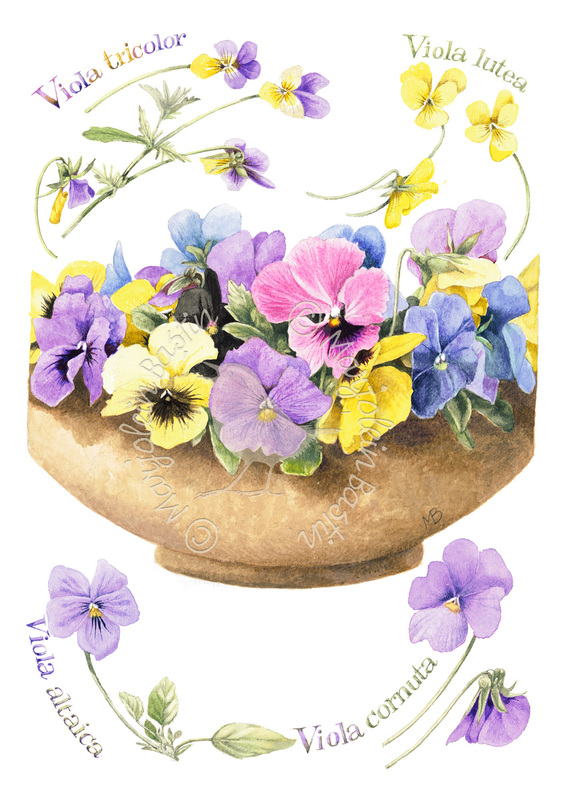 Believe it or not, these party-pansies are all descendents of just four wild predecessor violas, which I have painted at the four corners of this bowl. The ordinary pansy, with its black heart, the Viola x wittrockiana, is a direct descendant of the Viola tricolor and the Viola cornuta. The first hybrids were developed in England around 1830. Illegitimate children of the Heartsease, the Mountain pansy and the Russian Altai pansy were grown as “giant violas” (pensées). They became hugely popular!! The new violas appeared on dinnerware, were printed on fabrics, stitched onto pillows and handkerchiefs, dried for potpourri, printed on the first greeting cards and Victorian die cuts. From England these giant pansies traveled to Belgium and France. In 1848 they reached America, and in the 21st century they made it to my desk!